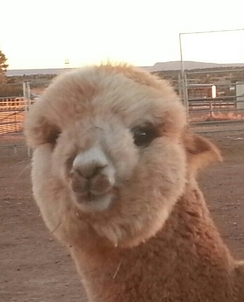 The offspring of two multi-champion alpacas, Solomon has racked up an impressive show record. He has a highly evolved fleece, gorgeously bundled and well organized. He presents with superior fineness and density, a beautiful consistent crimp and a four-square sturdy conformation. He is just a super guy with a quiet presence and a sweet nature. Champagne (Champ to her friends) is just a beautiful little girl, a super dense, extremely bright fleece organized nicely into very consistent bundles of fine crimpy fleece. She is just a little dear - sweet and demure with an adorable face - very teddy bear-like. I am totally intrigued by her and look forward to watching her grow and mature. Both sire and dam have impressive show records and we think our Champ could easily follow in their footsteps. Little girl is spitting off. We are very excited! Congrats to Rene and Bill Zender. 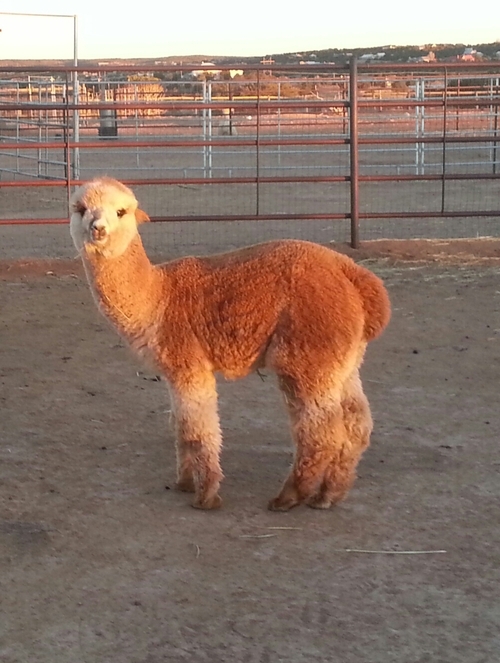 They have added this gorgeous young girl to their herd and can't wait to see that baby!! !